FarmgirlCyn: Peach Rosemary Jam, & How to De-skunk-ify a Cat! Peach Rosemary Jam, & How to De-skunk-ify a Cat! I found these recipes, I don't know HOW long ago, and have kept them tucked away in my canning folder for a cool September day. 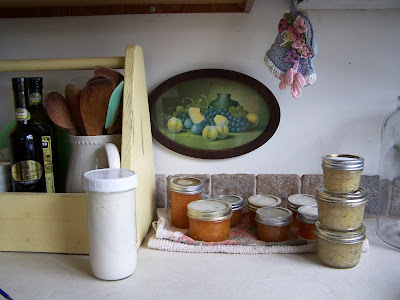 High's only around 62, it was perfect for canning...with the windows open, of course! If you are familiar at all with water bath canning, these recipes should be easy-peasy for you! No pectin needed as they create their own, natural pectin. The pear preserves are a bit runnier than the peach jam, and tho I didn't water-bath can them, I think the next time I would. The recipes don't make a lot, but I think it is the perfect gift-giving amount. Who do you know that wouldn't love some unusual "foodie" type gift for Christmas? 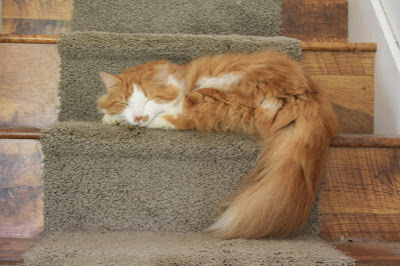 Ollie-by-Gollie came in yesterday morning smelling distinctly of skunk. 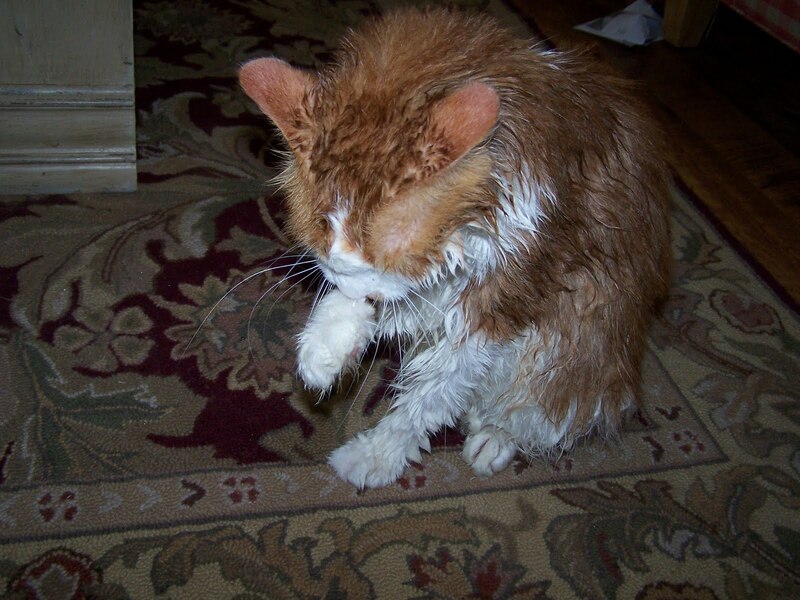 The last time one of our cats was skunked (Fuzzy) (see his story HERE) we used the old wives tale remedy of washing him up in tomato sauce. And when Fuzzy gets wet, he STILL smells like skunk! THIS time I was prepared! A while back I saw in Hints from Heloise the sure-fire method of de-skunking a pet. Mixed it up in a pitcher and poured it all over Ollie whilst he stood in the kitchen sink. Lathered the poor boy up and rinsed carefully. Got him out of the sink and towel dried as best we could. 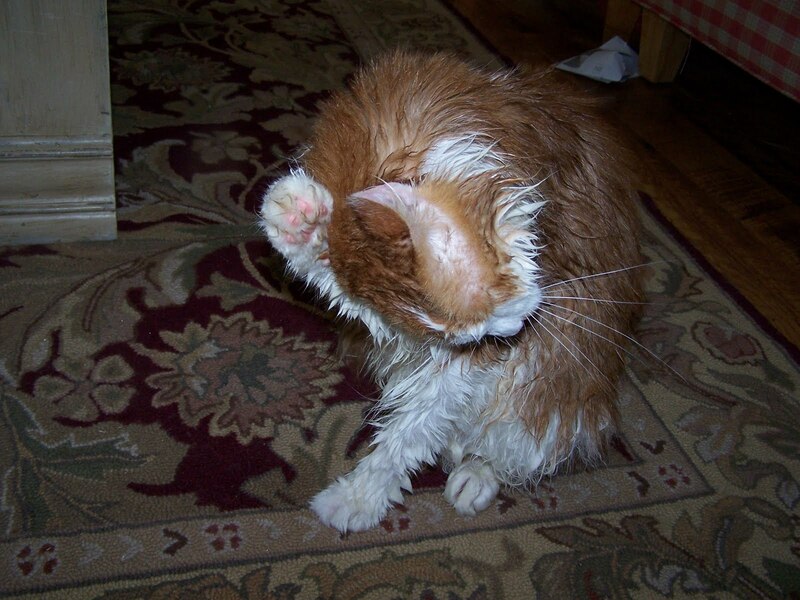 He spent the next couple of hours licking himself and drying off. This remedy is a keeper! That skunk remedy is a good thing to know! One of those things you hope never to have to use but glad to have if you do! what a time I would have de-skunk-i-fy-ing him!! Good job! I am amazed you were able to completely resweeten the cat. A testament to your formula and scrubbing capabilities! Ollie is simply adorable ~ now that he is all sweet smelling again! This is good to know, we have plenty of skunks around here. What a pretty cat he is. LOL Cindy! I *loved* the title of this post..."de-skunk-ify"...is that a word?? ;-) What a lovely looking cat...how wonderful that you found out how to get him all sorted out! How I would have loved to have known about that method years ago when lived out in the country. Every now and then one of our dogs would get hit by a skunk..and would slink around for days smelling terrible. I think my dad used a couple of quarts of buttermilk. I have no memory if it worked or not as I was too young to have retained it. but..I DO remember the smell. What a sweet cat. He is beautiful! And that deskunk smell recipe is a whole lot messier too! I have no idea how a skunk smells, but it sounds like something I don't want to come across!! How does the rosemary jam taste? I have tonnes of rosemary growing & would have never thought to use it this way - but what a great idea! Sorry to hear about the kitty problems, NOT Fun I'm sure! Blessings and again THANKS! Can't wait to try it. Peach and Rosemary Jam sounds yummy - bet it would be good as a glaze for chicken or pork. And thanks for the skunk potion. We often smell skunks outside and a few times our dog has wanted out in the middle of the night after something and thank goodness I smelled the skunk before he got out the door. you actually put BLEACH on your cat? OMG! Did the peroxide make his orange fur lighten up? I need a better recipe for de-skunking my dogs. Seems they get sprayed at LEAST three times a year.